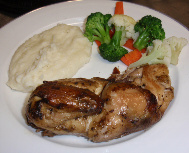 Golden brown, tender and juicy homemade roasted chicken. Served with mashed potatoes and steamed vegetables. Juicy and crispy seasoned pieces of fried chicken (4 pieces). One of America's favorite comfort foods. A dish of ground beef and minced vegetable molded into a loaf and baked. Two pieces center-cut pork chops grilled to juicy and golden brown. Seasoned and grilled NY Steak . Served with mashed potatoes and mixed steamed vegetables and Steak Sauce on the side.